CPL would like to thank everyone that came to the first Open Day of 2019. Thank you to everyone for joining us at the CPL Open Day. On Friday 15th March 2019 CPL opened the doors to prospective and loyal customers to show exactly how we manufacture our market leading conversions. The CPL Open day was a great success thanks to the turnout of guests that came out to tour our three manufacturing facilities and test a large range of the vehicle conversions we have to offer. 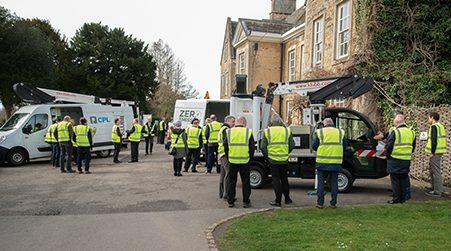 Throughout the CPL Open day we demonstrated the large variety of innovative conversions which included the largest range of electric vehicles on the market. The K26 Fully electric, zero emissions cutaway conversion, is the perfect compliment to the K20 Nissan e-NV200. The two conversions are both fully electric and cover all specifications for the eco responsible companies working at height within a number of sectors including: Telecoms, Utilities, street lighting and maintenance. The fully electric Goupil G4 made its debut in the UK at the CPL Open Day. 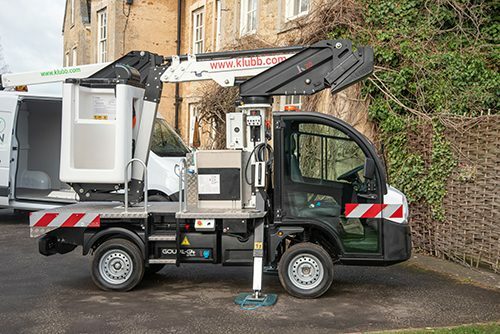 With an outstanding working outreach of 10m and over 4m Working outreach this conversion finishes off the outstanding range of electric vehicles Klubb have to offer. There were two of the K42 5t Iveco’s, one with a large fibreglass basket that has a safe working load of up to 265Kg and our famous plastic basket which was part of a very large order last year. We also demonstrated our market leading pick up conversion which Openreach very kindly allowed us to have on show for the day. If you are interested in any of the conversions we showed at the Open Day, please contact us for further information or a demonstration at your location.